CANTON, Miss. 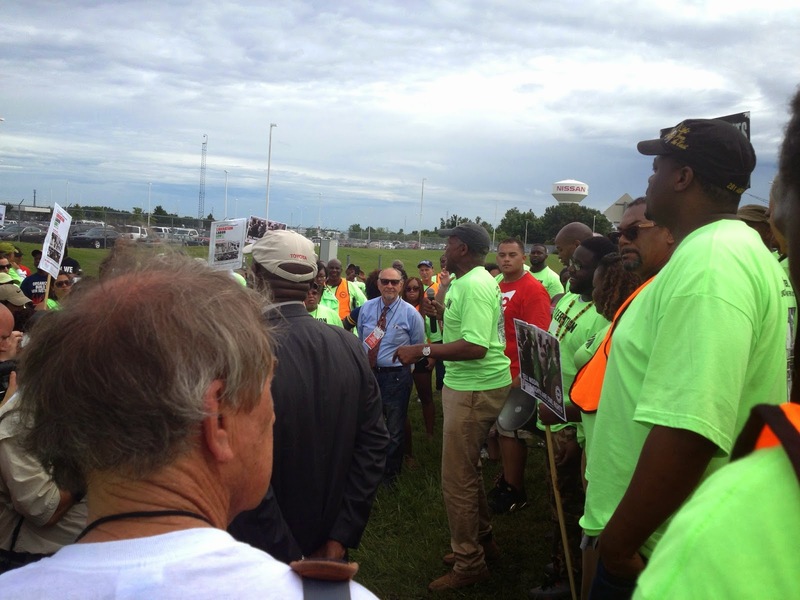 -- The June 27 pro-union rally by an estimated 400 students, activists, ministers and workers in front of the mile-long Nissan plant here was the perfect culmination of the Mississippi Freedom Summer 50th Anniversary Conference in nearby Jackson. 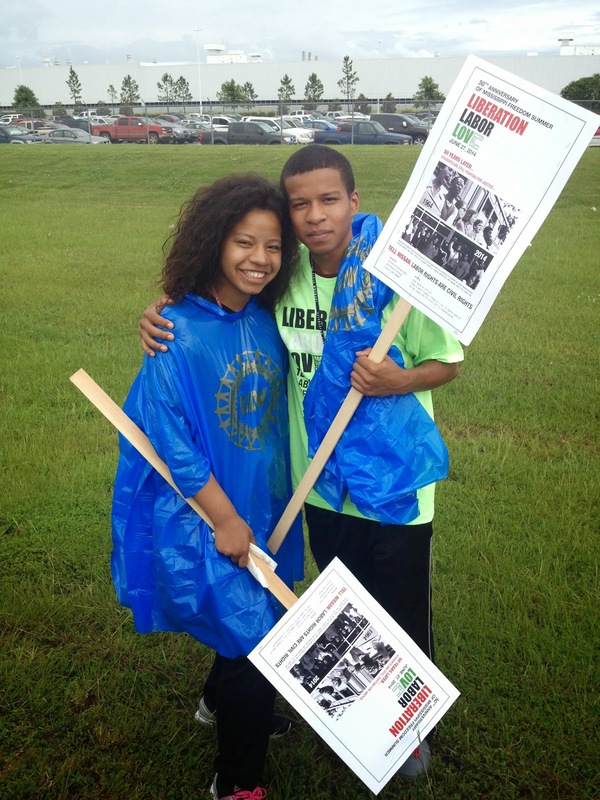 College students from as far away as New York and Missouri joined with students from historically black schools in the area such as Jackson State University and Tougaloo College to demand that Nissan allow a fair election for the thousands of workers in Canton to decide if they want to join the United Auto Workers. 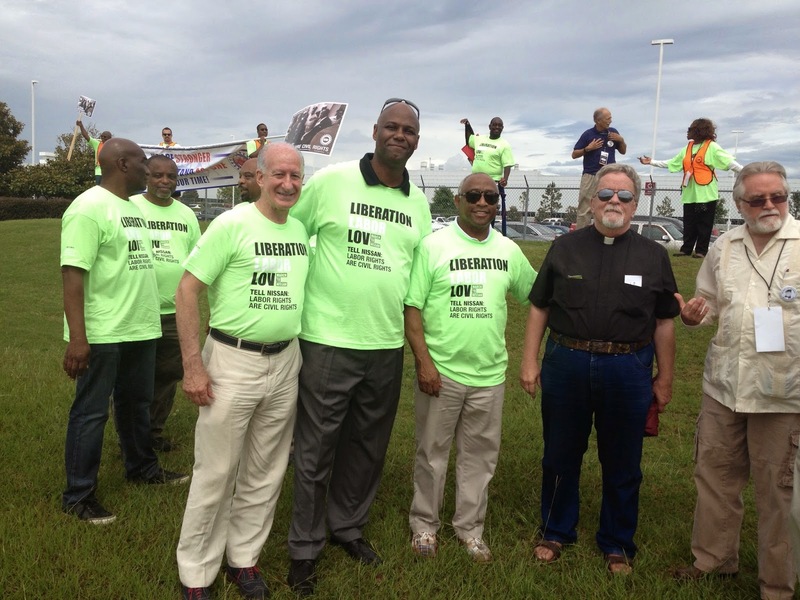 At the event were legendary civil and labor rights activists like Bob Zellner, still working in the trenches today in Wilson, N.C., prominent actor Danny Glover, veteran labor organizers Bruce Raynor and Richard Bensinger, labor priest Fr. Jeremy Tobin, political strategist Marshall Ganz, and many more. Of course, the students were central to the event, chanting "Ain't No Power But The Power Of The People!" and joining Glover in delivering a petition to company security officers at the front gate that declared: "Labor rights are civil rights." Nissan has strongly resisted efforts to allow a union in its Southern plants although its workers are organized in other countries. Workers in Canton have complained of cutbacks in health care benefits, arbitrary changes in work hours, increased use of temporary workers, and anti-union harassment. "It's for the people," said Akilah Fuller, a 19-year-old mathematics major at Jackson State University who is from Detroit. "It's always good to show support. They're not alone out here. We're here to show that they don't have to be scared." "It's for the workers," agreed her brother Nathaniel Fuller Jr., 19, an engineering major at Jackson State. A union would "help them have good working conditions." 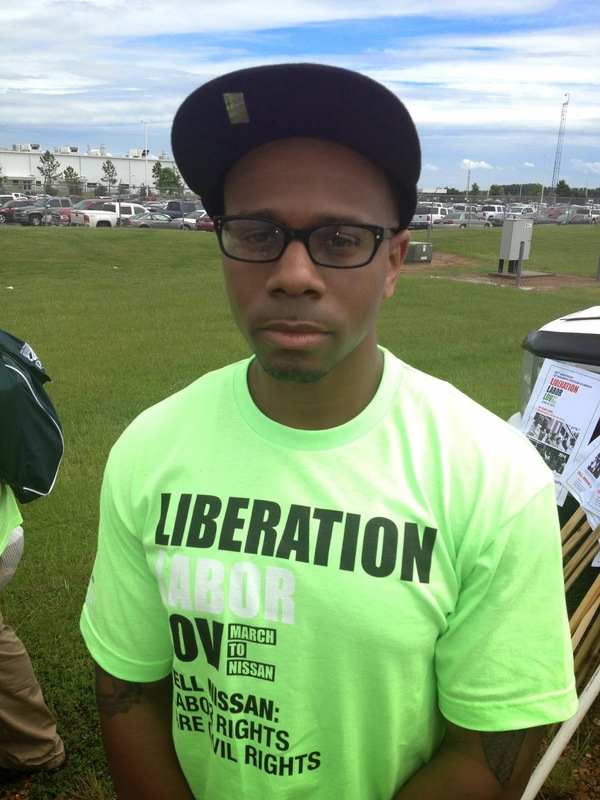 Brandon McMillan, 31, a 10-year veteran worker at the Nissan plant in Canton, said he's hopeful of eventual victory. "I truly believe we have a real good shot. We have to keep a level head. We have a lot of supporters. Fifty years ago this exact same thing happened for civil rights." More than 1,000 student volunteers came to Mississippi during "Freedom Summer" 1964 to help bring an end to racial segregation. Among those working for civil rights in the state were Mickey Schwerner, Andrew Goodman, and James Chaney, who were murdered by racists that summer in Neshoba County, Miss. "We're here because workers have a right to a fair election in the spirit of Christian morality," Father Tobin said. The Rev. Isiac Jackson, who chairs the Mississippi Alliance for Fairness at Nissan (MAFFAN), had this to say to the hundreds gathered in front of the plant: "Nissan is exploiting the workforce of Mississippi with a plantation mentality! Union today! Union tomorrow! Union forever!" 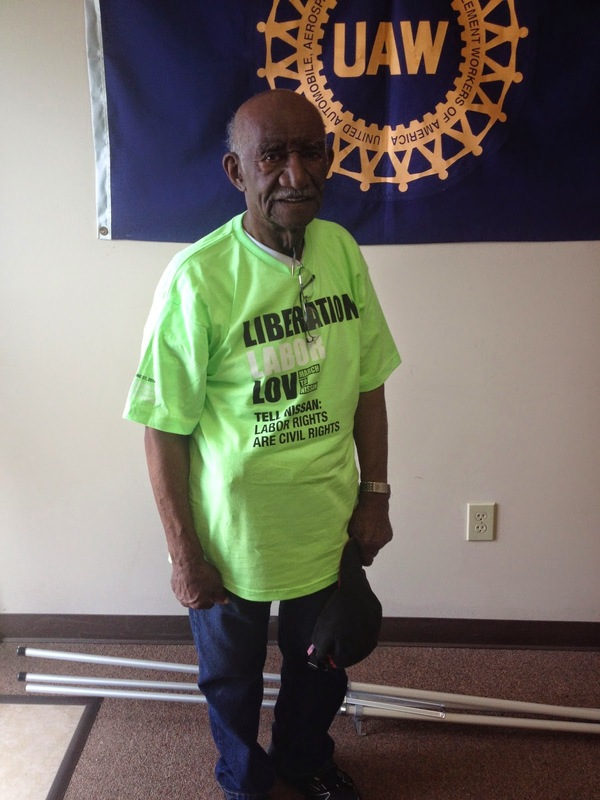 Among those at the rally was 88-year-old Arthur Duncan of Tchula, Miss., who joined the UAW in 1945 and participated in a 113-day strike at General Motors in Michigan. "With the union, if something happens and it's not your fault, you have someone to speak for you. If you don't, you're out. It's like having a lawyer to plead your case." Duncan recalled seeing legendary UAW leader Walter Reuther at rallies and meetings many years ago. "I thought the guy was a great man. He was doing things to help people." As for the current campaign in Canton, Duncan said, "I believe Nissan will come around. Can't say when."